Why is it that Wikipedia is a man’s world? Why is our community 90% male, mostly white, either young or retired, mostly nerds, people whom you will not meet in clubs, a high rate of temporary singles… and mostly amateurs in the fields of their Wikipedia activity (the the coolest providers of knowledge in all these fields)? Because we are using a software which only such nerds would want to use? And why does this particular community focus on this particular kind of knowledge? Because this is the knowledge these people happen to have? Is Lila Tretikov right, and all we have to do is get more women and more Africans on board, and we will have more articles on women’s health and all things African on Wikipedia? The idea is fascinating: Imagine we would use a wiki to fill it with the entire knowledge of, let us say, a tribe of African rain-forest people: Their language with all its grammatical categories and specialised vocabulary would build the structure. We would cover all the items of knowledge these people have created – plants, animals, materials… and we would present these things in their original categories. Our wiki would offer their views of the past, their notions of the world as it is, whether round or flat, whether covered with rain forest or something they would just not think of. One would fill all this into an isolated wiki to keep it clean. We would want to have this knowledge with all its intrinsic limitations, and we would would add videos and pictures to show all this knowledge in its practical contexts. The closed wiki would be needed to keep this knowledge intact. The Greenland Inuit would otherwise begin to delete wider sections of all this rain-forest knowledge as apparently inadequate. Christian missionaries would not only point at the gross errors in beliefs; they would immediately swarm out to teach these rain-forest people what they should know about Adam and Eve and the historical Jesus. Global knowledge is a mess. Wikipedia is a medium of 19th-century positivism. The medieval world of one unified knowledge under the care of Christian dogmatics and Christian universities worldwide has been adopted by the modern sciences. They, however, have discredited all the previous categories of “sectarian heresies”, “pagan ignorance”, and “superstition”. We are now interested in the one knowledge which academic studies and the sciences have to provide and in subsets of knowledge we will allow under categories such as “knowledge of this particular epoch” or “knowledge of this culture”. Complex (and arbitrary) categories are added to map internal disagreements. We will allow a competition of “scientific models”, we will speak of “fringe views” and “mainstream views”, and keep them apart from “religious tenets” or “conspiracy theories”. “Science denial” is a a new category in the field that would have been “sectarian heresy” in the Middle Ages. We employ sociologists, cultural historians, and anthropologists to create this new tapestry of one knowledge with all these pockets of alternative knowledge. 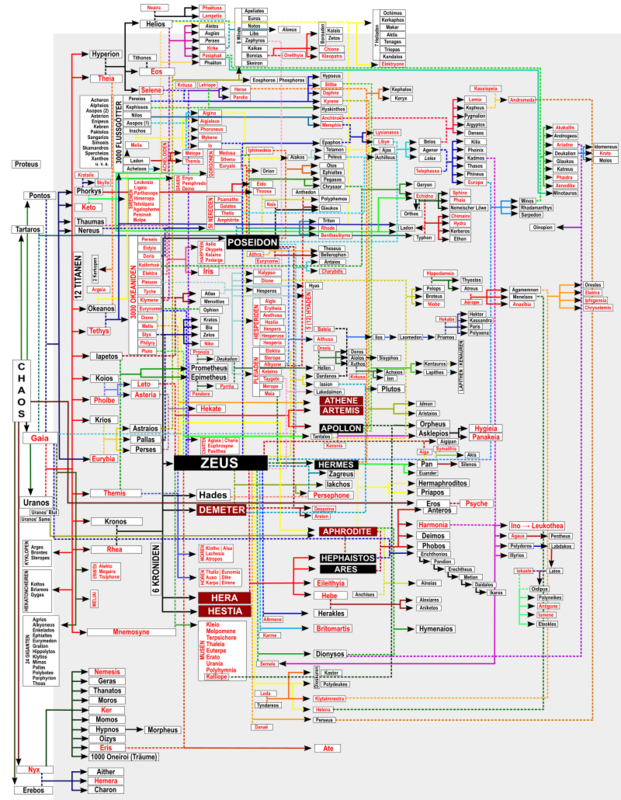 Wikipedia is basically an attempt to recreate this our modern Western arrangement of knowledge. Our site does, at the same moment, show a startling reflex of Bildungsbürgerlichkeit – of a bourgeois pride in an authoritative education, in the knowledge an encyclopaedia should offer. One will not find this Bildungsbürgerlichkeit among university employees, among members of the scientific community, among intellectuals. It takes a bit of game theory to understand why Wikipedia could only generate a community like this with this particular agenda, this particular idea of knowledge to promote. The first determining factor is the software feature that turns wikis into fully transparent web platforms. 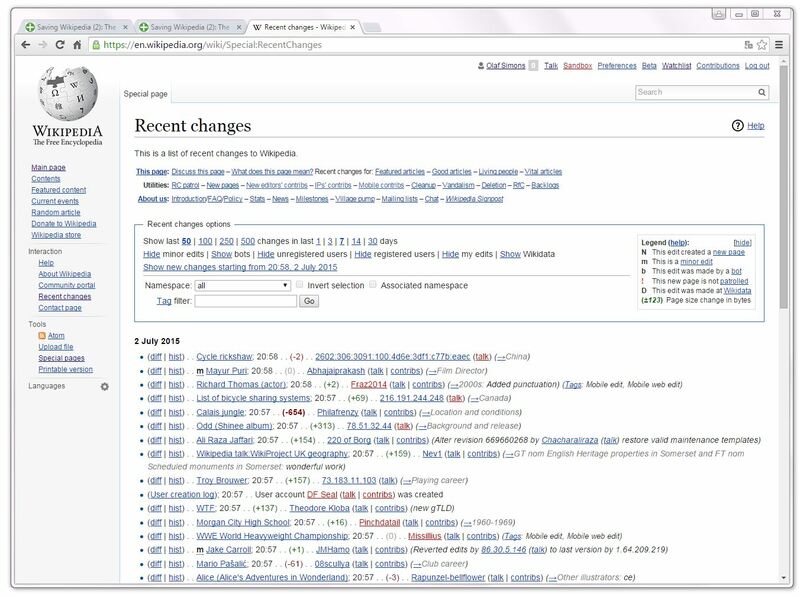 Everything that is done on a wiki is documented (and can be undone with one click). Recent changes lists all the changes down to the first edit, version histories come with each article to do the same, watchlists can be created to see the changes of selected articles. Anyone interested can see what is happening right now. 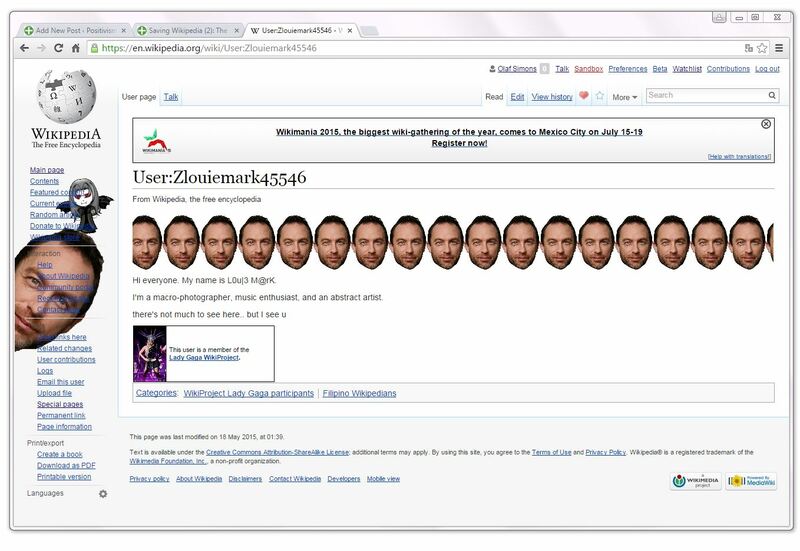 This is the software feature that turns wikis into fully functional bodies. Change a comma in the remotest article and it will be a sensation anyone can react on with a protective move. The second determining factor created the disturbing environment – an environment we can try to assimilate or to block: Even unregistered users can modify any page on Wikipedia. The software will register the interference of an IP-address. This is our extra low threshold that should create a universal itch to touch us and to see how we respond. The third determining factor was the feature that gave Wikipedia its present community, its brain and its various organs: Anyone can open an account on Wikipedia under whatever identity he, she, it or they would like to have on Wikipedia. Log in and all your further edits will go onto this account. Anyone can contact you. You can now create a personal watchlist and monitor all changes on pages of your personal interest. You can contact other accounts and form a collective to monitor certain changes – that’s why Wikipedia has complex internal organs, or regular internal institutions if you like. Wikipedia was small and of almost no use in its initial phase. Pupils would love it because it was easy to exploit these pages for copy and paste homework. Things began to change in 2003 and 2004 basically thanks to the enormous prestige encyclopaedias enjoy in our Western societies. You can claim to be important if encyclopaedias begin to offer articles on you. Wikipedia exploded when it became clearer that it would be be easy and interesting to storm the new collective hall of fame that was about to arise here. The input that was now arriving should have killed Wikipedia, yet it turned Wikipedia into the hotspot of the web in 2004, 2005, and 2006 and into a living fortress. Wikipedia began to frustrate all those who felt that they could use this page for their individual purposes. The community began to block attention seekers and conspiracists, it reacted on companies that would try to advertise their products on Wikipedia. The software was suddenly the ideal medium which a fully stratified society with various institutions could use to create and to defend its work. The new traffic was otherwise a challenge to supply all the articles people were looking for or trying to hijack. I remember one crucial incident from 2005 that can perhaps illustrate the productivity of the messy situation. An IP-address had been fusing text fragments from a GDR dictionary of philosophical terms into German Wikipedia articles. The problem was not so much the infusion of Marxist-Leninist dialectic materialism. Those who detected the insertions were far more concerned about the copyright infringement. We were propagating a dictionary of free content. The publishers of the dictionary could sue Wikipedia. We tried to contact the mysterious activist; it did not stop him. Eventually two Wikipedians discussed the deletion of the entire philosophy section on DE:WP. It would shock our opponent to see all his work deleted overnight. He would realise that he was from now on fighting against an organised community. What was more interesting: A project group was formed to coordinate the fast replacement of all these articles. We immediately realised that our new articles would be quite unlike all the eclectic garbage we were about to delete. We organised an online chat and a round of confessions followed: Who was what – in ohilosophical terms, personally. I felt extremely uneasy and confessed that I was some kind Wittgensteinian positivist. Others confessed that they were Kantian idealists, or interested in Greek philosophy. For a moment I thought this was the end of the entire project, the beginning of the ultimate edit war. It was a actually the coolest moment of mutual understanding imaginable. Others would have different views; we would respect and anticipate these views and turn them into our asset. Each of us would write the articles he would write with the strongest personal commitment. Writing this, I hear all the alarm bells ringing through the present community: They did everything Wikipedia should not do! They dismissed our holy NPOV policy, they promoted notions of personal affection and individual authorship! We began our work and could see what our colleagues were doing on “their” articles. We protected each other wherever one of us was attacked by other Wikipedians or by an IP-address. We eventually discussed our articles with immense tolerance. I had written a brand new 35-page article on Epistemology and felt uneasy about the freedom with which I had led my readers through considerations. The article received favourable reader reactions and so it stayed. The little story form 2005 should shed light on the group dynamics of 2005 and 2006. We were forming communities within Wikipedia and we would meet on a sunny weekend to finally see with whom we had been doing all this marvelous work. We would also meet on larger Wikipedia gatherings where we realised that others had formed similar communities in our far wider battle against vandals, IP-addresses, and trolls, and in our new attempt to become the biggest encyclopaedia extant. Cite your sources. When external sources are consulted in the writing or verification of an article, provide a list of references (books and articles as well as web pages). If an article is about a person or organization, list its homepage. Not only is this intellectually honest, but it will help readers to find more information. Do it especially if topic is controversial (like Genocide). If an article has a large number of sources, consider creating a separate bibliography subtopic. “If an article is about a person or organization, list its homepage.” – That was almost the invitation to turn Wikipedia into the new yellow pages of the web. We were advertising our services among all the attention-seekers we would soon have to check. A list of links at the end of each article was of interest because our articles were mostly bare definitions back then in 2002. The footnote feature arrived in 2006 as the ultimate weapon against all the hordes of self-proclaimed experts. We told them that they could write on all subjects as long as they would give us respectable footnotes on this their “knowledge”. Those we wanted to frustrate were kindly referred long explanations of what we would accept as respectable sources. We would compile other pages on the “neutral point of view” and our “no original research clause” in order to discredit all the conspiracists and esoteric fanatics who imagined that they could pervade the dictionary that invited them so freely. Sebastian Münster, Cosmographia, lib. 6. 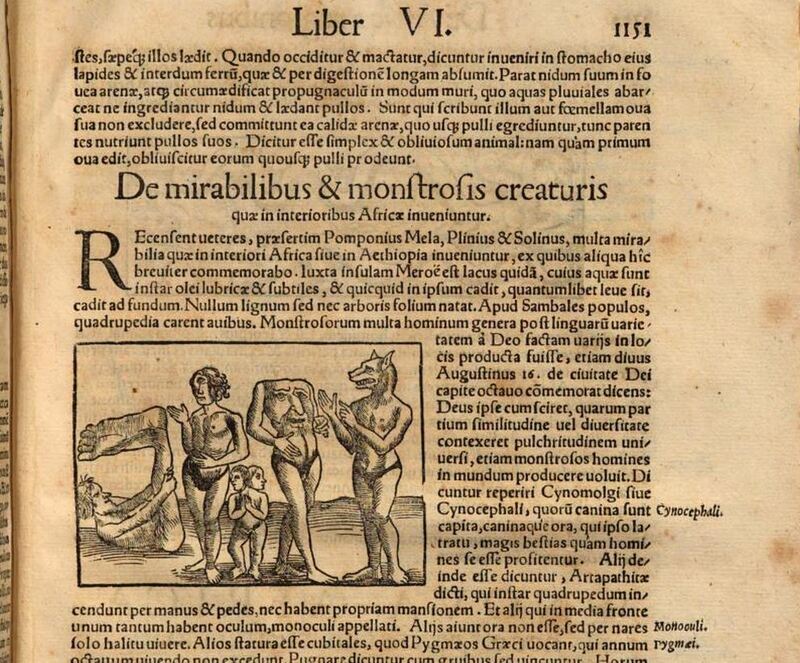 (1554), p.1151. Wikipedia became a paradoxical institution in these wars. We invite the crowd and we silence this crowd on its arrival: Yes you can write on Wikipedia but only as long as you quote authorities whose statements we can check. Tretikov’s man from Botswana and the woman who should offer us better articles on women’s health will be at a loss in the Wikipedia universe. Why should the man from Botswana offer “his” knowledge if he has to do it on the basis of sources which Wikipedians in New York and Tokyo can verify from behind their screens? It is already clear what sources they will be able to check from there: Western media and books written by white historians and anthropologists. Who is that woman who would love to revise our article on women’s health? 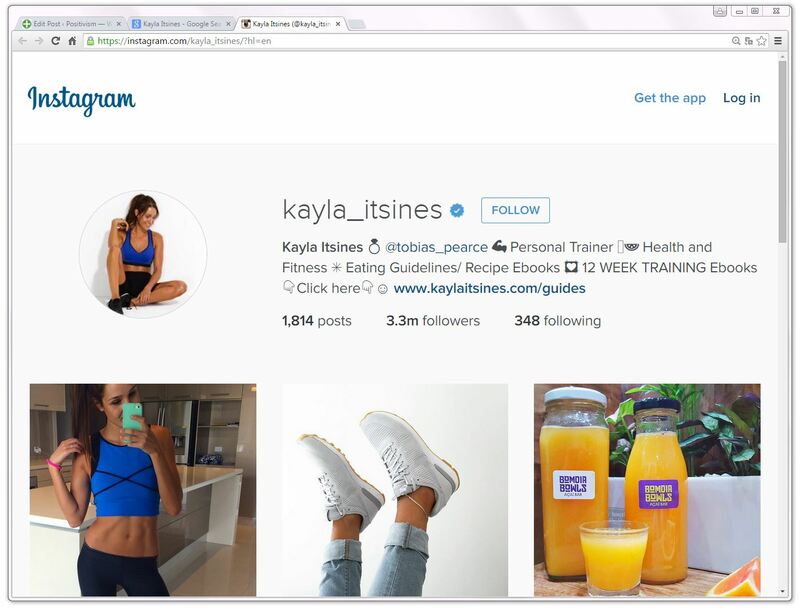 Kayla Itsines? Forbes just had this wonderful article on her and how she turned herself into an expert on all women’s health issues by posting selfies and her personal training advice on her Instagram and Facebook accounts. We have implemented almost all our internal rules in order to frustrate the plans such authors could develop on Wikipedia. Wikipedia is downright unattractive to all people who can defend their personal authority in their field of knowledge. You can be a professor and Wikipedians will ask you for secondary sources on this “your” knowledge. Wikipedia is the nerd’s paradise since it allows the modern internet user to suddenly beat the expert with this our new command over the only sources we can all verify on the web. That’s Wikipediology at its finest. Wikipedians are cool, flexible, curious, immensely pragmatic, uncomplicated on any community event, improvisers; I cannot think of another community that would have created such a resource. What could the Wikimedia Foundation do, to have more articles on women’s health and on Botswana on Wikipedia? Run campaigns? They will fail (see my remarks on “Recruiting the better community – a history of wonderful blunders” in my previous posting). Get the new visual editor – the editor that women and Africans will be able to use, so Tretikov in her curious assumption of race and gender inhibitions? The editor will be less important than the cool screen appearance Wikipedia should have. People will want to become Wikipedians as long as they love our site. They will handle the technology as long as the product is cool. 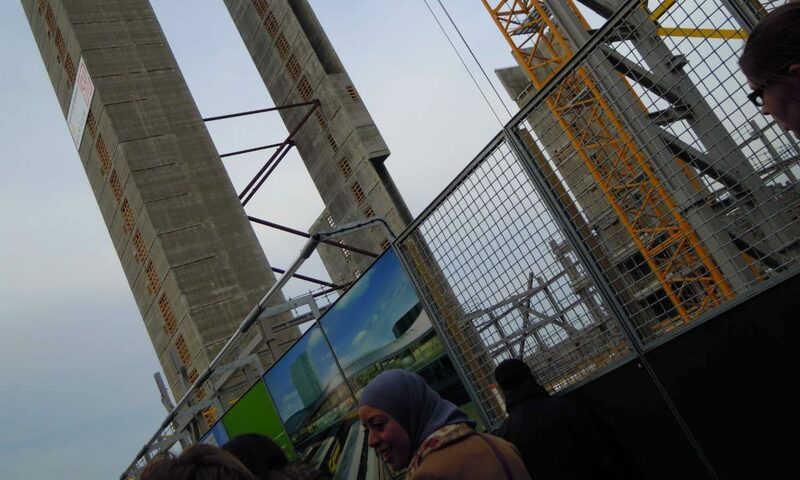 Our central impediments are not technical. They are organisational requirements which we have designed in order to prevent growth – that particular growth which we could not hope to control from our computers all over the world. There is little the Foundation can do to get more articles on Wikipedia. It is the Wikipedia community that must change some of its notability requirements and, boom! we will have whatever growth rate they want to have. If we state that every person who has ever lived should be entitled to have a personal article on Wikipedia – that would create an explosion in our biography sections. Historians would turn Wikipedia into their new database, hobby genealogists would fill all their knowledge about their ancestors into Wikipedia. I know of course why we have opted against such “incusionism”. We protect our value as an encyclopaedia wherever we prevent the inflation of articles. Our “no original research” and “neutral point of view (NPOV)” policies add limits of qualitative growth to the limitations of quantitative growth which we create with our notability requirements. Things are even more tricky here: Original research is the one ingredient that makes all the difference between copy-and-paste tabloid journalism and serious investigative journalism, between the handbook wisdom of a cheap encyclopaedia and cutting edge academic research. The Encyclopaedia Britannica went for it and we will need it. What is more important: it will create gender equality on Wikipedia – the wish of the female expert to be on Wikipedia just as all her male colleagues. I know again why we agreed on all these regulations. We need them in order to mute all the self-proclaimed experts and attention seekers, the conspiracists and the young ladies who would love to sell their personal “Bikini Body Guides” (BBG is the article we should have) on our pages. They are just waiting out there to offer us their “original research” and all their “personal points of view”. Why can quality journalism and why can academic studies do what we cannot do? Our serious problem is here the dubious simulation of collective authority on Wikipedia.